Hi, I’m Vanessa from Punkin Patterns. 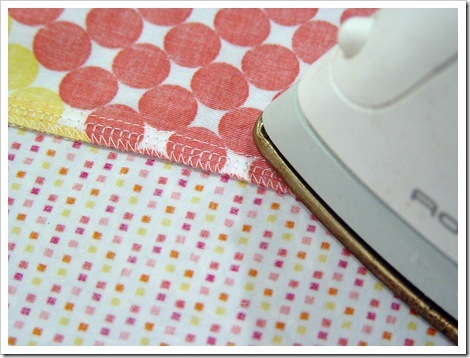 I’m excited to be back here today on Everything Etsy to share with you this great tutorial. 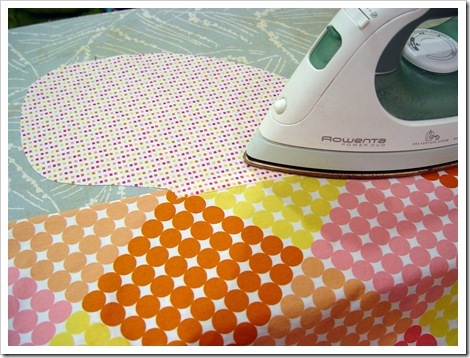 Spring is upon us and it’s time to make some skirts! Skirts can be an easy addition to your wardrobe and easy on the wallet too — especially if YOU make it. These skirts have great, deep pockets. So useful and practical. Every skirt should have pockets! 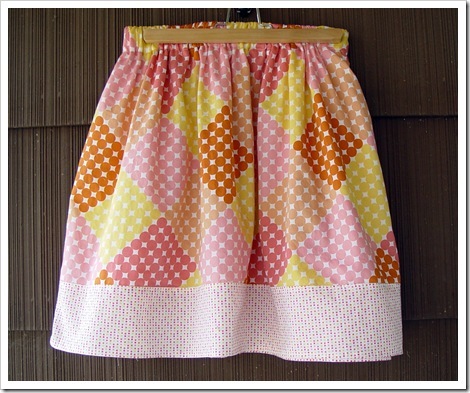 The Easy Peasy Skirt with Pockets is simple enough for even the beginner sewer and a quick sew for a seasoned pro. The skirt I’ll be showing you how to make has a stripe at the bottom. 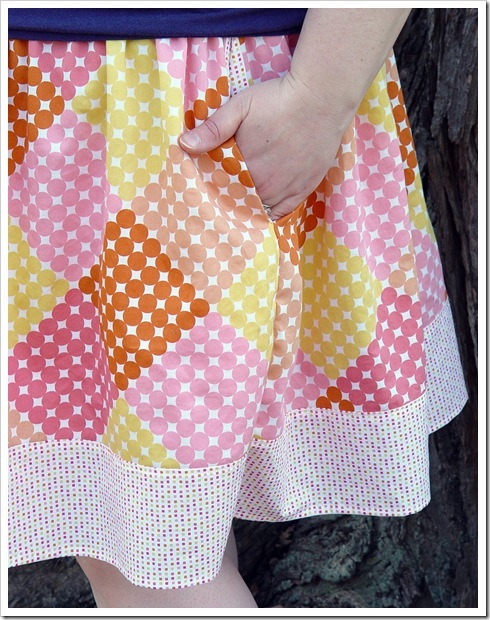 For more variations on the Easy Peasy Skirt visit my blog. 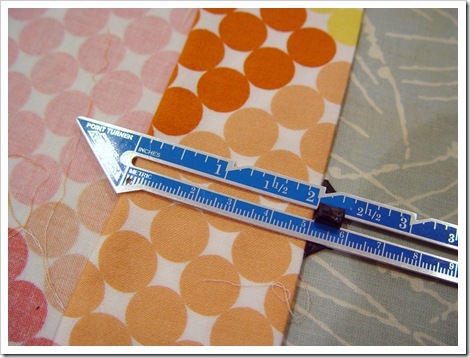 We add the one inch to the waist (W) measurement for seam allowances. Now that you’ve got that cut out, you can cut out your pockets. Use the pocket template found here. Cut out the two pieces and tape them together overlapping the shaded portions. 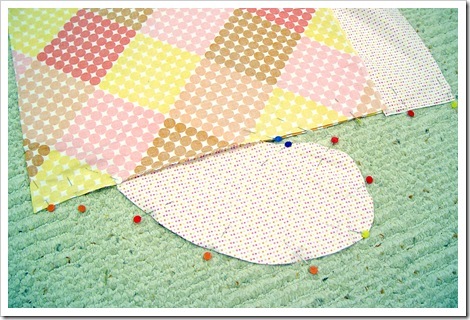 Cut out two pockets on the folded fabric (so you end up with four pieces). 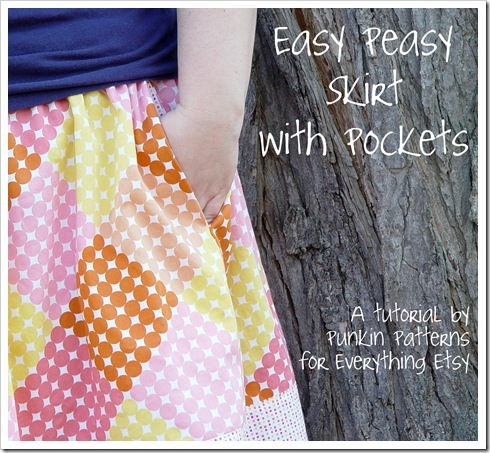 There you have it…an Easy Peasy Skirt with Pockets by Vanessa from Punkin Patterns! Thanks for sharing your awesome tutorial with us! 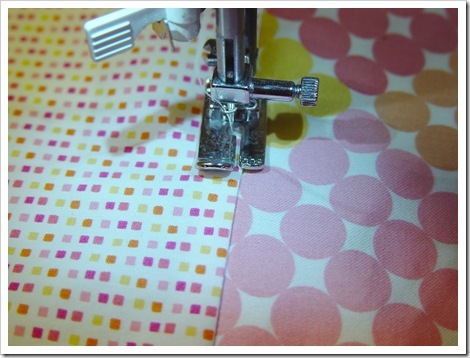 Are you getting ready for warm sunny days by sewing up a little something sweet? I’d love to hear about it! 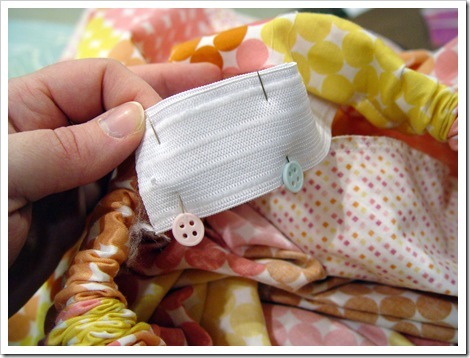 If it’s still snowing where you live this one is for you… 101 Sewing Tutorials for Winter! Cute! I have some perfect fabric for this! Thanks for the tutorial! This is so adorable and easily done. I love the colors you have. So neat. Also, I was wondering where did you get those adorable button pins…….I love them. Hi, my name is Wendy, and I don’t know how to sew. Phew! So glad to get that off my chest! But I have dreams of learning to sew and I think this project would be a blast! But I don’t understand the width thing. Is each of the two panels supposed to be twice the waist measurement? So the overall width would be four times the waist size? Any help you can give me here would be greatly appreciated! Perfect for spring! 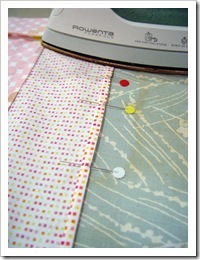 I’m getting ready to sit down at my sewing machine and this will be a great project! I’m just a beginner sewer but I’m working on this skirt this weekend. It’s so easy! Going to make my stepdaughter a matching one, also. Where did you get that kind of ruler (with the moveable middle piece to help with casing measurements)? or what is that called? The ruler is a slide(?) ruler. 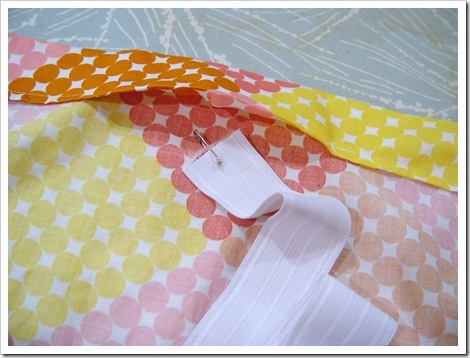 it will be near the tape measures and pins in the fabric store. I LOVE this! thank you for putting this together as this is EXACTLY what I want for my summer wardrobe!! I have a 15 mo old daughter who LOVES going to the park and I HATE shorts because they don’t fit me right. I just made one for knee length and can not wait to go to the store tomorrow for more fabric!! Hi! I just started learning how to sew about a month or two ago. I just made this skirt–it took two evenings. I’m getting lots of compliments on it! Thank you for making such an easy-to-understand-and-execute tutorial available! I made this to match a dress I made for my granddaughter and her American Girl doll. Since the picture looked full I made the width narrower like she did. BE CAREFUL! If you have a “tummy or hips” you will make a big mistake. I cannot wear this because it turned out like a straight skirt. And the pockets stick out because it is too tight. 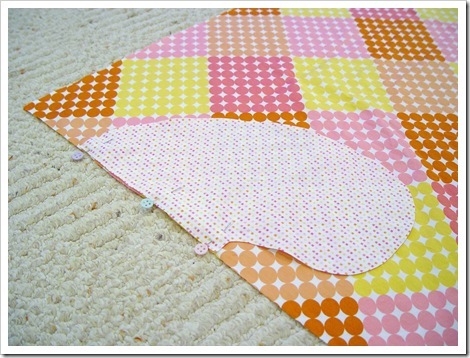 It is fast to make and I have more material to make another but I will make it wider than what she did in her pattern. I’m not a huge woman just have the “baby and age” tummy. Just disappointed about the skirt. Our granddaughter lives 12 hours away by car and we are visiting in three weeks. I made it in 2 1/2 hours. Yeah! Awesome…thanks for stopping back by and letting me know! I need some help to make sure I cut this skirt correctly. This is the first attempt at the skirt for an adult and I’m making it for my sister. HELP. Okay so her waist is about 32 inches and her length is about 17 inches – We are doing the two fabric pattern(with the stripe) Can you help me make sure my match is correct and I’m understanding everything correctly? So her width is 64 and her length is 17 right? so the width of each panel is 65 inches wide by 16 inches long ???? Right? 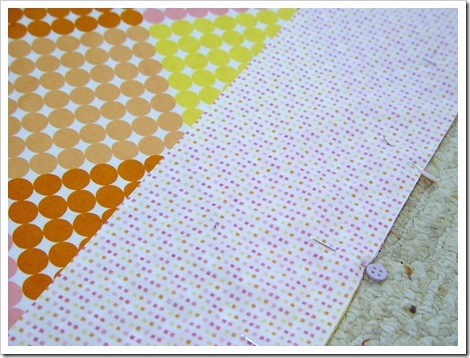 The stripe is w + 1 = 65 plus L= 5 so the stripe will be 65 wide by 5in long right? Using 1/2 seem allowance this will give me a skirt that is 17 inches long when finished right?